Last night, I continued my playthrough of Suda51’s cult classic Killer7 on Kotaku’s Twitch channel. The game has a reputation for being weird, and as I keep playing I’m discovering that its unflinching dedication to not explaining a damn thing is one of its most compelling quirks. Released in 2005 on the Nintendo GameCube, Killer7 follows the story of a group of assassins as they face off against nefarious killers and get drawn into a heavenly clash between two super powered beings. Players take control of each of the seven assassins of the Smith Syndicate. Each of these individuals—from the masked luchador Mask De Smith to the young punk Con Smith—are personas that the protagonist Harman Smith can transform into. Killer7’s first chapter offers little explanation for anything that is occurring, instead throwing players into the action. The first chapter involves blasting through zombie-like enemies called Heaven Smiles before shooting the wings off a hyper-stylized anime girl. It ends when Harman fires his sniper rifle at the cackling villain Kun Lan, who catches the bullet and rides it all the way to the Seattle Space Needle. While the resulting confusion can make the story seem nonsensical, it also manages to convey a sense of mysticism that serves the game well. The raw spectacle of it all suggests something important, even if we can’t see the big picture yet. This sense of grandeur complements the game’s design, which delights in throwing unexpected and unexplained gameplay changes at the player. Most of Killer7 involves walking down linear corridors and confronting enemies. Players are severely limited in their movement—they press the A button to run forward and tap the B button to change directions. When encountering an enemy, the player can switch to a first person mode to aim their gun and fire at a target’s weak points to instantly kill it. The majority of the game follows this formula, but shifts also break this familiarity and create confusion. A major example happens at the end of the second chapter. Facing off against a deadly female assassin, the player must shoot her a certain number of times before a timer runs out. It appears to be a normal boss battle, but the only thing that matters is how many times you shoot her. The game never explains this victory condition to the player and initially places them in the shoes of Mask De Smith, who fires the slowest out of any playable character, setting them up for failure. If Killer7’s story offers little explanation, neither does the gameplay. Under normal circumstances, this lack of clarity might prove frustrating. The player struggles to understand what is happening and what to do, but Killer7’s commitment to its bizarre internal logic is charming. It allows the player to approach the game as a sensory experience first and foremost, turning each session into a colorful bullet ballet. It also imbues everything with a playful vibe. Killer7 is a game where a character gives misleading information on where to shoot a boss, leading the player to a sudden death. It is a game where the player is never really told how to use items in their inventory, leading to awkward flailings to solve environmental puzzles. This absurdity blends well with the more mythic story beats, creating a world that never completely knowable but still eager to toy with expectations. 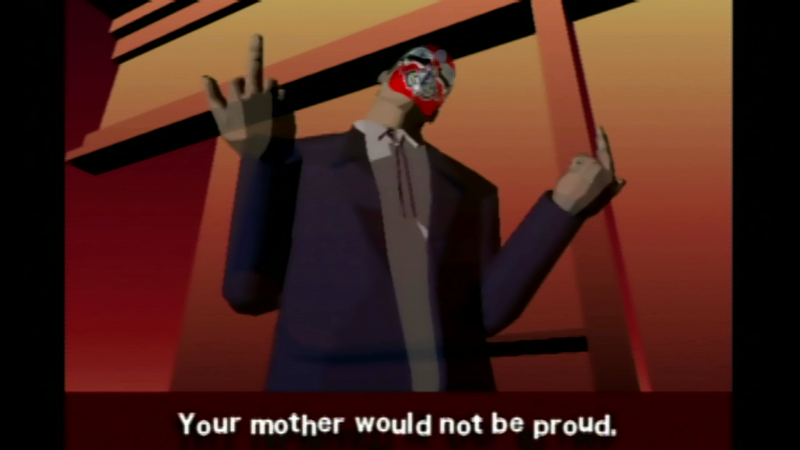 In the times when Killer7 does try to explain itself, the game opts to overwhelm the player with lengthy world-building cutscenes and an intricate web of characters with intersecting motivations and goals. The world of Killer7 runs on a logic that the player is not allowed to completely see. Through snippets of godlike figures and politicians carrying out obtuse agendas or gameplay that delights in pulling the rug from underneath the player, Killer7 that while it might seem weird to you. B but if you just relax and enjoy the ride, there’s plenty of excitement to be had.